John Kerry used his first major address as secretary of state on Wednesday to make an urgent call for comprehensive action on climate change, a worrisome sign for Canada's Keystone XL pipeline. In yet another potentially ominous sign for TransCanada's Keystone XL pipeline, John Kerry used his first major address as secretary of state on Wednesday to make an urgent call for comprehensive action on climate change. "We as a nation must have the foresight and courage to make the investments necessary to safeguard the most sacred trust we keep for our children and grandchildren: an environment not ravaged by rising seas, deadly superstorms, devastating droughts and the other hallmarks of a dramatically changing climate," Kerry said in a wide-ranging speech at the University of Virginia. "If we waste this opportunity, it may be the only thing our generation — generations — are remembered for. We need to find the courage to leave a far different legacy." While Kerry made no mention of Keystone XL specifically, his State Department will soon decide the $7-billion pipeline's ultimate fate because it crosses an international border. Keystone XL, which would carry bitumen to the U.S. Gulf Coast from Alberta's carbon-intensive oilsands, is considered a symbol of "dirty oil" by American environmentalists. They're stepping up their efforts to urge President Barack Obama to make good on his recent rhetoric on climate change by rejecting the pipeline. There have been signals that the pleas of environmentalists are not falling upon deaf ears at the White House. David Jacobson, the U.S. ambassador to Canada, told The Canadian Press last week that Obama's vow to take aggressive action on climate change during his recent State of the Union address was meant in part as a challenge to Canada. John Baird, Canada's foreign affairs minister, responded a few days later that the U.S. could stand to follow Canada's lead on several climate change fronts, in particular on coal. "We're the only country in the world that's committed to getting out of the dirty coal electricity generation business," Baird said. "These are real meaningful steps that will either meet or even exceed the work that's been done thus far in the United States." 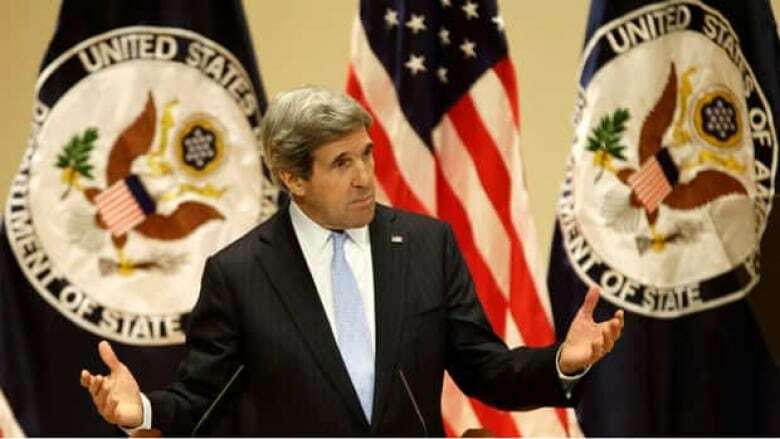 Kerry's remarks on Wednesday came less than two weeks after his meeting at the State Department with Baird. He was non-committal about Keystone in his joint news conference with Baird, and was rumoured to have been tepid about the pipeline during their private meeting. The former Massachusetts senator, a fierce climate hawk during his 28 years in Congress, said he hoped to use his role as America's No. 1 diplomat to promote green energy technologies given they could propel U.S. industries into the "next great revolution in our marketplace." "We need to commit ourselves to doing the smart thing and the right thing and to truly take on this challenge, because if we don't rise to meet it, then rising temperatures and rising sea levels will surely lead to rising costs down the road," he said. Strings attached to pipeline approval? There has been increasing speculation in the U.S. capital that the Obama administration might want to exact something in exchange for Keystone approval, such as a rumoured greenhouse gas emissions levy that would be imposed at the border and could raise much-needed revenue for the United States. Obama rejected TransCanada's previous permit application due to concerns about the impact on an ecologically sensitive area in Nebraska. But Nebraska Gov. Dave Heineman, previously a Keystone foe, recently gave his blessing to TransCanada's new route around a crucial state aquifer. The State Department's latest environmental assessment of the new route is expected soon. With that report in hand, Kerry is expected to make the final decision on the pipeline in the spring.